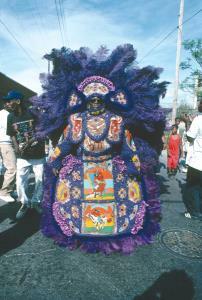 Feathered-and-beaded Mardi Gras Indians and those in street clothes rang their tambourines and chanted as they gathered near the large City of Love Church for the home-going of Big Chief Larry Bannock. The legendary chief of Gert Town’s Golden Star Hunters passed away on April 30, 2014, at the age of 66. That was just three days after a strong performance at the New Orleans Jazz & Heritage Festival. It is often said that when it rains on a funeral, the sky is crying. Yet it was a great blessing that none of the predicted showers fell on the impressive Black Indian procession that paraded in honor of Chief Bannock in the neighborhood that stood as his regular stomping ground. Larry Bannock began masking Indian in 1972 as chief scout with the then-named Golden Star. He rose within the ranks of the Gert Town gang—the only Indian group of which he was ever a member—to the positions of third, second and first spyboy. In order to preserve the gang’s presence on the street, Bannock reluctantly took over its leadership in 1979 and renamed it the Golden Star Hunters. Chief Bannock affectionately called his gang the “17 Hounds,” his “dog soldiers” from New Orleans 17th Ward. Often, his intricately beaded designs would reference the canine names. “If you can’t run with the big dogs, stay on the porch,” Bannock, a fiery, opinionated and dedicated Black Indian chief, would strongly suggest. A registered master craftsman, Bannock conducted many lectures and gave sewing demonstrations both locally and nationally. He performed in France and at New York’s Carnegie Hall and was featured in National Geographic magazine as well as on television shows including 60 Minutes and 48 Hours. One of his suits was chosen by the Smithsonian Institute for a touring exhibition. Bannock was 24 years old when he first masked Indian. That could be considered a late start in the tradition, where children are often brought up in tribes led by their fathers, uncles or other relatives. “My aunt and my mama really didn’t want me to mask,” explained Bannock, who often credited Joe Caldwell (often called Big Chief Joe by the members of the Golden Star Hunters) as getting him involved in the Black Indians and being his mentor. Observing Bannock’s interest, Caldwell soon began instructing him on how to build a suit. He pointed out that old, discarded awnings could be cleaned up and cut to make an apron (the lower piece of a suit). Then they’d be ready to draw on. In turn, Bannock would eventually teach others the art of creating a suit, including Jimmy Ricks, who joined the Golden Star Hunters as a flagboy in 1985. “He taught me how to sew—beading and rhinestone-ing,” says Ricks, who, since 2006, has been the chief of the Shining Star Hunters. “People from all over the city would come to his house to watch him and talk to him.” Chief Ricks adds that some of those students now lead their own gangs. Big Chief Bannock didn’t suffer any fools when it came to the Black Indian culture and was particularly vocal when it came to Mardi Gras Indians who didn’t make a new suit every year or paid someone to sew for them.